In Outerhope’s limited edition book Lyrics and Backstories, Micaela and Michael Benedicto alternately pen commentaries for seven featured songs, and pair each one with a corresponding illustration or photograph. The 32-page volume provides old and new listeners a rare glimpse of the personal thoughts behind the siblings’ songs. 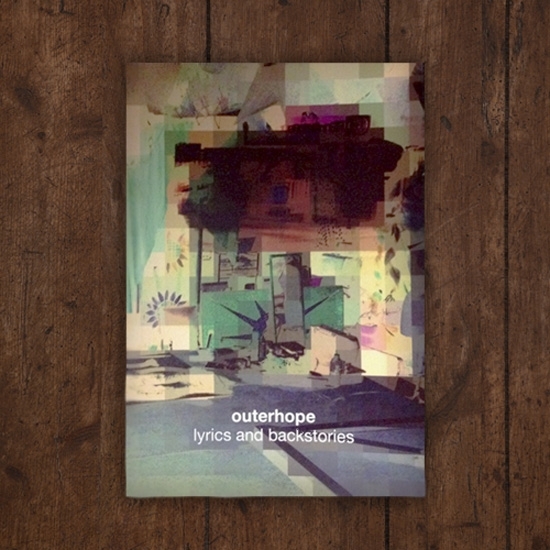 Lyrics and Backstories was made exclusively for supporters of Outerhope’s 2012 U.S. tour. “I decided that the only way to write about my dad was to think of him as a sort of mythical figure, like Johnny Appleseed, or Puff the Magic Dragon, or a modern-day Pied Piper. My father belonged to a rare breed of men who are equal parts goofy and debonair. He had an exceptional voice, deep and old-fashioned, and he had an excellent vibrato-tipped whistle. You would hear it and picture someone with coattails and a top hat, spinning his cane like someone in an MGM extravaganza, the sound wafting suspiciously from the general direction of the family kitchen on a Sunday morning. He had 200 neckties, and a rainbow of americanas, which he rarely ever wore. My dad’s whistle was the key indicator of his life philosophy; his carefree demeanor belied his adult struggles and his difficult youth. He was the person who knew what to do, fixed what was broken, and answered questions. My dad’s illness and passing marked the late beginning of my adulthood, followed by a seemingly endless disarray of broken appliances, the discarding of objects, the discovery of secrets. My brother and I have always wanted to do a folk song in the pared down, traditional sense, and I think this is the closest we’ve ever gotten. I think my dad would have liked it more if it had been patterned after an old jazz standard, but unluckily we didn’t really inherit that sensibility. This record, to me, is about ghosts, and he is my favorite one.